With the discovery of these loyal, fun and heartwarming dogs, the popularity of golden retrievers has grown throughout the ages. First bred for their hunting tenacity and their ability to withstand the cold and wet terrain of northern Europe, golden retrievers have since become a favorite breed among families, search and rescue groups and service groups. Along with their bouncy, upbeat personalities when people think of what a golden retriever should be, certain things come to mind. When people think of golden retrievers, they think of their appearance. These dogs are a large, powerful, active breed and their bodies should reflect that. Their bodies are full of muscle under their luxurious coats. They were bred to be able to track game through the underbrush of forests and their structure is what enables them to do so. Golden retriever males can be 23 to 24 inches in height at the withers and 65 to 75 pounds. Females can be somewhat smaller at 21 and a half to 22 and a half inches in height at the withers and 55 to 65 pounds. Aside from their large size, golden retrievers typically have a very sweet face that influences pleasure in those in their presence. Partially named for the color of their gorgeous coats, golden retrievers come in various shades of golden. They range from a rust color to a cream color. Golden retrievers have a dense, water repellent coat that serves its purpose by protecting them in the marshy conditions the northern Europeans used to hunt in where goldens were originally bred. Golden retrievers require moderate grooming. Their double layered coat usually needs grooming twice a week or more often when they are shedding heavily. Although they do not get completely clipped like some other dog breeds, they do require straggly hairs to be trimmed. The golden retriever’s dense coat may be straight or moderately wavy but should lie flat against their body. Their tails contain fuller, longer and feathered fur that should be trimmed to keep up on a neat presentation. Although all golden retrievers originally came from the same Scottish highlands, throughout the years there is now a noticeable difference between the British and American golden retriever breed. The British golden retrievers are stockier then their American cousins and typically lighter in color. Several other differences lie in the shape of the eyes, head and muzzle. The Canadian golden retriever breed is a mix of both the British golden and the American golden. They are similar in height and weight to the American golden but contain a color that is close but not as light as the British goldens. 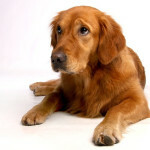 The average person also tends to associate golden retrievers with a friendly and confident personality. They are one of the most trainable breeds. They have the ability to sit quietly for hours in a hunting blind as well as put their focus into a given task and work until collapse. Their limits in a work dog have only been seen in the area of being a good watch dog because of their love for people and strangers.